Πατήστε τη φωτογραφία και δείτε όλες τις φωτογραφίες του Guest House Gerry. 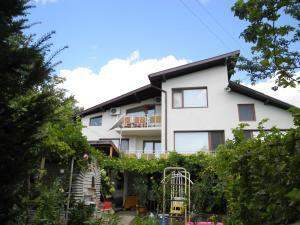 Guest House Gerry offers free WiFi and rooms with air conditioning in Balchik. Boasting a shared kitchen, this property also provides guests with a barbecue. The property is a 9-minute walk from The Palace of Queen Maria. At the guest house, every room is equipped with a wardrobe and a TV. Guest House Gerry offers a children's playground. Botanic Garden Balchik is a 9-minute walk from the accommodation. Varna Airport is 32 km away.